This week is Aaron's birthday week. Birthday week doesn't have to mean a gift each day, it could be a movie night, foot massage or special breakfast. I asked Aaron what he wanted for his special birthday week breakfast and he came up with baked eggs. I made a version with sliced tomatoes, bacon, swiss cheese and eggs. The recipe also called for something I didn't have... smoked paprika. Things have a way of popping up for me multiple times until I pay attention. There was a chapter in Amanda Hesser's book "Cooking for Mr. Latte" where she sings the praises of smoked paprika. Then I was looking for a recipe for corn fritters like the ones I had at dinner in San Jose and what I found was this recipe for Double Corn Fritter Cakes with Smoked Paprika Glazed BACON!. Finally this morning was the last straw when I was looking at recipes for baked eggs and the one I found called for... you guessed it... smoked paprika. A little research revealed that the paprika I am used to, the paprika that I sprinkle on deviled eggs comes from Hungary. Smoked paprika comes from Spain and is traditionally smoked over oak fires. Apparently it can go on practically anything and tastes amazing. I need to get some now of course. Where did you eat corn fritters in San Jose? I live there and I cannot find them. Smoked paprika is indeed delish. Penzey's carries a very good Smoked Spanish paprika. A good choice for a birthday meal. Happy Birthday to your hubuddy! Can we get that baked egg recipe? I second that, can we get the baked eggs recipe? It looks so yummy! Also, I am a huge fan of paprika, mostly because I am Hungarian but I do like both kinds, it does taste great on all sorts of food! Tin Tin - the restaurant I had corn fritters at was T&O Company. go out of your way to uy the little tin you have there on the right ( la chinata ) that is THE BEST one, you won't need to look any further. capeesh? 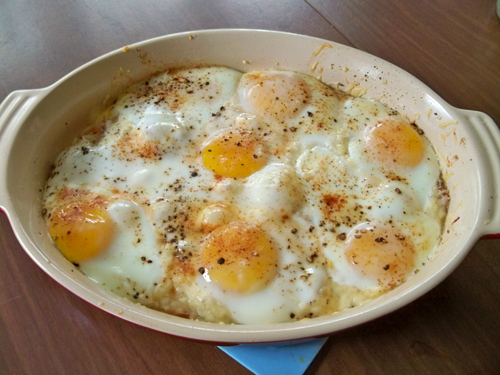 at a glance, the baked eggs look like half-boiled eggs. they're my favorite!